Welcome to Antiques & Moore! The vase features multiple medallions around the body of the vase with assorted shapes and designs. Several of the medallions contain floral scenes with the two largest medallions containing delicately painted birds along with assorted flowers. The background is rust colored with gold "clouds" with three bats encircling the lower neck area. Nice attention has been paid to the design details and the vase is very attractive. The vase is in excellent Estate condition with no chips, cracks or repairs although there is one very tiny no-harm nick on the foot ring of the base. Measures 6" high with a top diameter of 2 1/4", maximum width is approximately 3" and the base is 2" in diameter. Marked on base with unidentified Japanese script. We at Antiques & Moore have been in the Antiques business for over 30 years and try to describe our items as accurately as possible. We are happy to answer any questions and always appreciate your business! 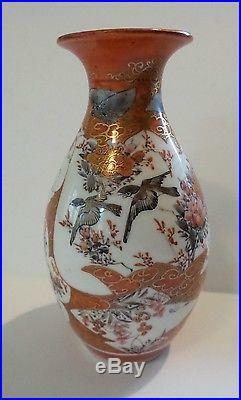 The item "ANTIQUE JAPANESE KUTANI PORCELAIN VASE, MEIJI PERIOD (1868-1913). BIRDS & BATS" is in sale since Thursday, April 27, 2017.